Executives, entrepreneurs, and professionals from all over the world, hire me to brand them professionally. It’s not enough to simply have a complete LinkedIn profile. In order to be successful, your LinkedIn profile must be compelling and engaging to your reader. Your LinkedIn headline falls right under your name on your LinkedIn profile. The default headline is simply your most current job title but if you want to get noticed, that’s not the way to do it. Instead you want something punchy. Something that will hook the reader and make them want to read more! Here are just a few examples of POWERFUL LinkedIn Headlines I created for clients. Notice how they are keyword-packed for search engine optimization, contain a benefit statement so people know what they can expect from working with them but they also contain a clear call to action. it’s time to generate your own LinkedIn headline. 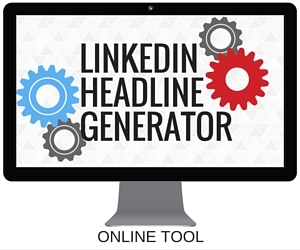 My LinkedIn Headline Generator App is an online application that makes creating your LinkedIn Headline fast and easy… and best of all it’s completely FREE!